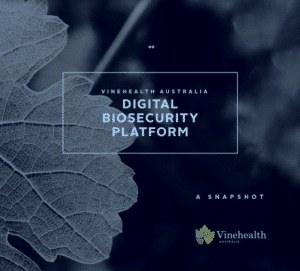 Vinehealth Australia is planning a major new biosecurity IT platform to replace the existing Vineyard Register, to improve the organisation’s ability to protect vineyards from pests and diseases. “The current vineyard register is essential, but through innovation we feel it could better support all parts of biosecurity management, particularly planning, response management and surveillance,” says Vinehealth Australia CEO Inca Pearce. With the support of PIRSA, Vinehealth started work on this project in October 2016 and has completed the consultation and value proposition phases. “We are working towards an adaptive and innovative solution to take full advantage of rapid leaps in technology to more effectively support grapevine biosecurity management,” Inca says. The specifications for Vinehealth’s desired biosecurity platform are significantly broader than that of the current system. As a minimum, the new platform must meet the legislative requirements of the South Australian Vineyard Register required under the Phylloxera and Grape Industry Act 1995. Other desirable components include facilitating training support, a communications portal, ability to host data analysis and modelling, support traceability and as a repository of geographically-based information relevant to grapevine biosecurity. We’re now discussing the platform with potential partners and we’re finalising a procurement plan. View the Digital Biosecurity Platform Snapshot here.